The best supplies for all your printers, at the right time every time. Keeping on top of your company’s toner requirements can be a thankless task. It can feel like a never-ending circle as you replace cartridges and search for the best bulk deals online. Using our remote software, we can monitor all of your printer’s toner levels from our HQ and proactively dispatch new toner when you need it, at the best price possible. This approach ensures you’re spending less time searching online and more time working on the things that matter, not to mention the added cupboard space you will recoup from holding a reduced stock. We’ll monitor all your printers toner levels from our HQ and keep your consumable supplies restocked ahead of production. We’ll search online for the best bulk deals for all your print devices. We’ll proactively dispatch new toner when you need it, at the best price possible. What is a Consumable Supply Service? Consumable Services ensure that your company is ahead of print device toner replenishment through proactive dispatch of toner replacements as and when you need it. 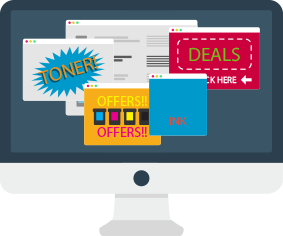 Using remote software, we can monitor toner levels across all your print devices and proactively dispatch new toner when you need it, at the best price possible. 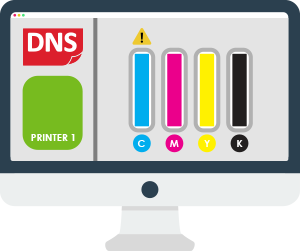 Our Consumable Supply Service remotely monitors all major brands of printers on your network, providing alerts as and when replacement supplies are required, allowing us to keep your consumable supplies restocked ahead of production by automatically dispatching replacement toner as soon as you need it. 1. Assess & Setup– We’ll identify all print devices in your network and install software allowing us to monitor consumable usage, regardless of brand. 2. Monitor & Manage – Using an alert system, we’ll anticipate the need for consumable replenishment when supplies are running low and identify the best quality replacements for your devices at the lowest price possible. 3. Dispatch & Deliver – As soon as your consumable stock begins running low, we’ll automatically dispatch new supplies, for all networked printers, before printing can be disrupted. • Monitoring all laser and inkjet printers on your network, regardless of model or brand. 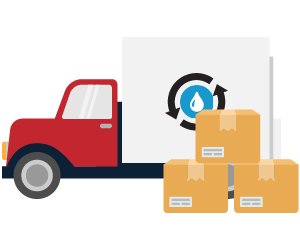 • Delivering consumable supplies at the right time that it’s needed. • Spend less time concerned about printer supply replenishment and more time focused on your business. • Keep your teams working with less disruptions. Save up to 40% with Xerox consumable supplies for non-Xerox printers. Regardless of brand, all your printers are replenished with rigorously tested, high quality guaranteed Xerox supplies. Supporting over 750 printer models from all major print device brand manufacturers and brands, our range currently includes HP® (99% coverage of laser models in Europe), Brother®, Lexmark™, Epson®, Kyocera®, Samsung®, OKI®, IBM®, Infoprint®, Canon®, Panasonic® and many other laser products. Xerox cartridges are not cheap compatibles that deliver unsatisfactory results and using them with non-Xerox printers will not invalidate your printer warranty. Each cartridge bears a 100% lifetime warranty and delivers page yields equivalent or higher than the manufacturers of your printer, meaning you can spend less but get more and achieve worry-free printing, page after page. Established in 1996, Document Network Services have over 20 years experience delivering document services and are leading UK Xerox Concessionaire Premier Partner, fully accredited by Xerox Europe year on year since launch and offering the full range of hardware, software, services & support packages. Xerox is proud to be positioned as a leader in the Gartner Magic Quadrant for Managed Print Services, Worldwide. 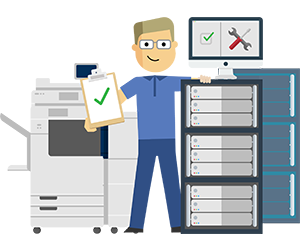 All Xerox digital solutions are serviced by Xerox (UK) Ltd and Nationwide service back up is supplied when required by dedicated, regional product specific engineers at any location in the UK. We provide a single, centralised solution for management of all your print devices, giving you the convenience and continuity of dealing with a single contact and supplier. Supporting more than 1,200 print devices from various manufacturers in one common framework, we provide print management services regardless of brand. To discover how our Consumable Supply Services could help your business, contact us today!